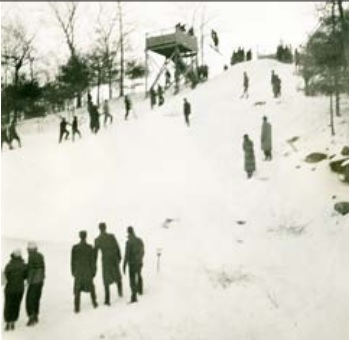 A 100-feet ski jumping hill was opened in January, 1929 in Blue Hills Reservation Park in Quincy, a southern suburb of Boston in Massachusetts. Total cost of constructing 2 skating ponds, toboggan runs, ski jump and warming house was $854 - only 2/3 of the budget assignated by Metropolitan District Commission. From 1929 to 1937 famous "St. Moritz Winter Carnivals" were organized there, attended by thousand of spectators. Though the ski jump was abandoned later, there are still remains of this facility near St. Moritz Pond.